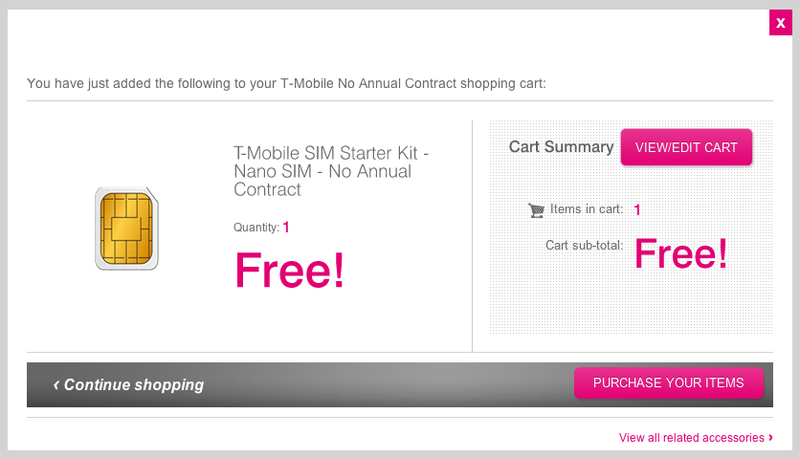 Remember when we told you yesterday that T-Mobile prepaid SIM kits were only $0.99 with free shipping? Well, we have a better deal for you. How does free sound? Those same prepaid SIM kits in full, micro, and nano are now 100% free with free 2-4 day shipping. You may as well order one or two (two is the max per person) if you are at all considering switching off your current carrier in the near future. Remember that T-Mobile is pushing out their LTE network as quickly as possible, plus prepaid plans are excellent for testing out service with phones like say, oh, the Nexus 5. The $30 unlimited text and data (5GB of full 4G speeds) plan is a no-brainer. *Note – Their payment system appears to be having issues, so if you are getting an error, hang tight. I’d imagine that with this kind of deal, everyone and their goat is trying to order a free SIM kit. Cheers Scott, George and Ryan!